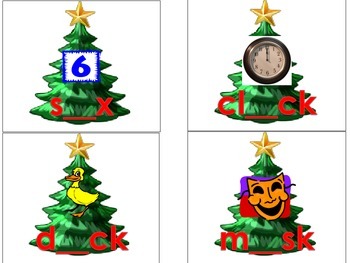 This Christmas themed fill in the blank short vowel word work activity! 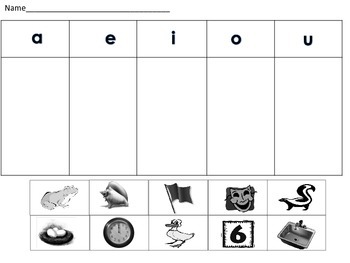 In this activity students read words and write the short vowel to complete the word. 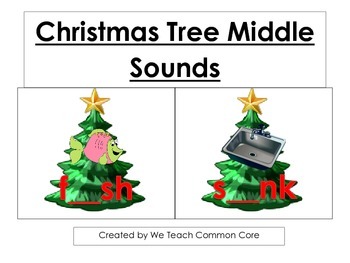 Students practice identifying the middle sound of words. 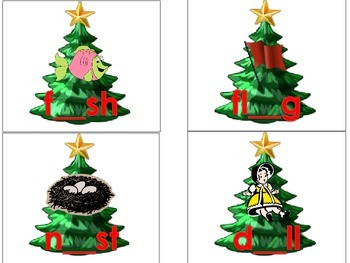 In this activity students can write the missing vowel sound on the Christmas tree card (laminate and use an expo or vis-a-vie marker). This activity can be self checking by writing the word on the back of the picture card. Great for you non or emergent readers as each card has a great picture to help students figure out the word if unknown. It comes with a cut and paste worksheet where students cut out pictures and sort them based on the vowel sound in the word. Print this activity on card stock, laminate for durability and have students start practicing. This is a great activity for a learning station working with manipulating letters and words. Great for Kindergarten or lower level first graders. RF.K.3a Demonstrate basic knowledge of letter-sound correspondences by producing the primary or most frequent sound for each consonant. RF.1.2d Segment spoken single-syllable words into their complete sequence of individual sounds (phonemes). RF.1.2c Isolate and pronounce initial, medial vowel, and final sounds (phonemes) in spoken single-syllable words.